Eagle Machinery & Supply, Inc. is located in Sugarcreek, OH and specializes in the manufacture of wood working machinery. Eagle acquired the Saw Optimizer, and its goal was to redesign the control and software for a state of the art fourth generation machine. The previous two generations had used Motion Engineering’s, MEI, PCX/DSP controller. This controller is EISA bus and uses the CPU of the host computer for its trajectory computations. This design had caused timing problems in the older machines resulting in poor performance. Furthermore, high-speed position capture is required on 4 separate sensors. Because the single axis PCX/DSP did not have support for high-speed position capture of 4 sensors, an interrupt card was also required. 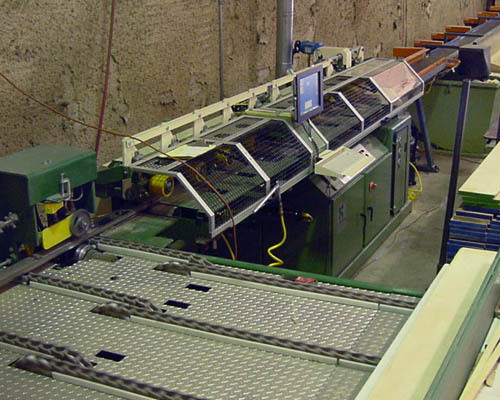 This system also had to control the Sorter, which transfers the cut pieces off a conveyor running at 600 ft/min. The single CPU architecture made this a very challenging task. Eagle turned to Tisfoon Ulterior Systems of Raleigh North Carolina for the design of its fourth generation saw optimizer. Tisfoon was involved in the saw optimizer starting with the second-generation machine and had extensive knowledge of wood working machinery and optimization algorithms. Tisfoon selected the Delta Tau UMAC controller as the corner stone of the new design. The selection was based on UMAC's two processor based architecture with combines the Turbo PMAC motion controller and a PC/104 computer. It was also based on UMAC's high-speed data acquisition and position capture capabilities. "The Delta Tau control system has given Eagle a real advantage over our competition. Our generation 4 optimizer has surpassed all our expectations, in speed, accuracy and reliability, thanks to the superior control provided by Delta Tau"
The UMAC along with the PC/104 computer were able to replace the PC, PCX/DSP, and interrupt card providing an elegant and industrial sound solution. Tisfoon used its HMI builder program, locoMotion, to write the human machine interface of the saw optimizer. locoMotion was built in support for Turbo PMAC and supports runtime assignment of P,I and M variables. The HMI runs on the fast and powerful Tisfoon PC/104 computer. The Tisfoon PC/104 computer has 2 USB ports, 2 serial ports, and 1 Ethernet connector with a powerful industrial grade PIII 700 MHz CPU. Tisfoon developed the motion program and plc code using its Delta Tau Compiler product. The Delta Tau Compiler supports any text edi tor and both central and included symbols resulting in highly readable and maintainable code. UMAC's built in power and capability did the rest. The UMAC's high speed PLC was able to control the high speed Sorter with power to spare. UMAC's built in support for integration with a PC/104 computer. UMAC's high-speed data acquisition. The dual ported ram communications between the Turbo PMAC CPU and the host PC/014 computer allowed for faster data transfer. Integrated high speed and multi-threaded PLC support. UMAC's ability to seamlessly communicate to a Windows host regardless of the host operating System. The Sorter worked flawlessly with conveyor speeds of 600 ft/min. 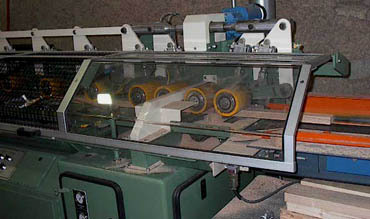 More precise cuts to 1/64 of an inch due to “S” curve acceleration; the lumber could be positioned at a faster rate without slipping in the nip rolls. A single controller for motion, Logic and Data. A fast, robust and reliable Saw Optimizer, that beats the competition in all aspects.